A $58 billion opportunity to increase sales and capitalize on a growing market—this is what catering represents for restaurants. But, tapping into this market calls for more than an expanded to-go menu. Operators looking to expand off-premise dining offerings, as well as those seeing stagnant order numbers, must consider and understand the catering customer and how best to reach them. Any successful marketing strategy begins with a clear picture of its target audience. In catering, that target audience spans two primary segments—business catering and social catering. Understanding the distinctions between them is crucial. Business or B2B catering customers include office managers and administrators, event planners, and medical sales professionals. These customers place catering orders for weekday business events, such as meetings, training sessions and company events. Think, a client presentation or a staff meeting. 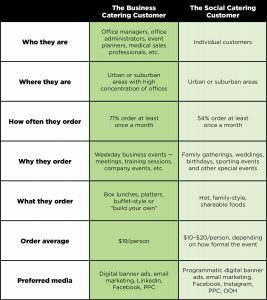 B2B catering orders are frequent—71% of decision makers and 91% of medical sales professionals order at least once a month—and carry an average order size of $19/person. Box lunches, platters and buffet-style catering are popular choices for this target, thanks to easy set up and minimal cleanup. Social catering, or business to consumer (B2C), customers place orders for family gatherings, special occasions, weddings and other functions. Orders are less frequent than B2B, with only 54% of consumers reporting they order catering at least monthly. Depending on the type of event, social catering order tickets average between $10 and $20 per person, with formal events topping the scale. 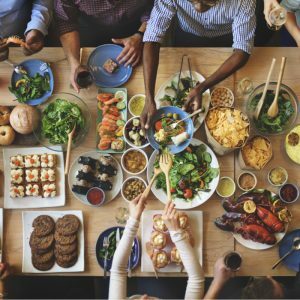 These customers prefer hot, family-style and shareable food versus a sit-down meal to encourage guests to mix and mingle. Flyers, bag stuffers and in-restaurant signage have remained staples in promoting catering offers. But those efforts are limited to guests physically visiting your locations. What about everyone else? Digital marketing opens the door to millions of opportunities to connect with potential catering customers. “Digital advertising allows for hyper-targeting based on geography and job title. In this way, we can effectively reach our delivery area including individuals responsible for business catering orders,” shares Stewart Hill, evok’s VP of strategic planning. Drafting a digital marketing strategy focused on catering sales calls for careful planning, custom content, meticulous selection of channels and ongoing optimization. Here are four areas to explore. Effective strategies begin with accurate targeting—ensuring your message is delivered to, and seen by, the most appropriate audience. With advanced targeting technologies, reaching individuals or organizations in your target now extends beyond basic demographics. Delivering a postcard to a business near your restaurant no longer qualifies as efficient targeting—at least not on its own. Programmatic advertising campaigns have allowed marketers to automate media buying based on intelligent audience and behavior targeting. These hyper-relevant profiles can also be optimized in real time, taking online behavior and search activity into consideration when determining where to display your catering ads. To reach corporate catering customers, marketers and operators are able to narrow audiences to those in certain fields or positions, such as pharmaceutical sales and nonprofit office administrators. If you have ever seen a banner ad on a website you frequent and thought, “I wonder how they knew I was looking for that,” programmatic buying is the most likely answer. Programmatic targeting can also be applied to the B2C customer. A person’s online behavior can identify if and when they are looking for a caterer. Clues could include researching venues in the area, visiting restaurant or catering websites or searching for catering ideas. With an estimated $38 return for every $1 spent, email remains one of the most effective methods of reaching both loyal and prospective customers. Email is a “warm” communication channel that reaches those who have shown an interest in your restaurant and those who frequent your locations. That being said, email marketing has evolved beyond weekly eblasts to a list of 10,000+ subscribers. To stand out in the inbox, restaurant operators must match messaging to recipients. Your corporate catering call to action may prove more effective when delivered to an audience likely to be interested in it, rather than a college student who signed up to receive coupons. List segmentation and marketing automation have become a staple in email marketing, conditioning recipients to expect relevant, curated content from brands. If you are one of the 49% of marketers with a goal of segmenting your email database in the next 12 months, getting started doesn’t have to be complicated. A good first step would be to filter subscribers based on how they joined your list. Did they give you their email in exchange for a $1 off coupon? Or did they sign up after seeing a catering-specific ad or ordering food for an event? The answers to these questions can help you segment your audience into unique lists and tailor the right content for each. Whether promoting limited time offers, new menu items or online ordering, restaurant marketers have seen impressive results from social media advertising. With catering, potential profits are just as promising. Collection of self-reported and contextual data, including usage of the platform, used to develop and hyper target truly customized audiences. Geotargeting to focus on metropolitan areas with a high volume of professionals or within a radius of your location(s). CRM integration to retarget existing customers with the highest expected lifetime value. While the nature of the social networking site makes it a logical platform to deliver social catering messaging, it has also proved a viable channel to reach corporate catering customers. The key is to tailor your messaging. Sports fans during football season and office managers at downtown high-rises have very different needs when it comes to catering. Speak to those needs in your Facebook ad campaigns. Although a less traditional social media advertising route, LinkedIn presents an opportunity for catering managers and restaurant operators to reach a network of decision makers. With 1.1 million users, ads on this platform can be segmented by industry, company, company size, location and title to target and ultimately connect with the right people. Aside from sponsored posts appearing across every device, LinkedIn also offers sponsored video content. Following tests of this format with more than 700 advertisers, LinkedIn reports engagement times being three times longer than for standard sponsored content. Targeting and channel selection are only one part of the catering marketing equation. Optimizing where those communications ultimately lead your potential customers may play the determining factor in whether or not an order is placed. From digital to traditional marketing channels, catering communications should lead customers to a custom landing page. That page must be optimized to drive catering orders with clear calls to action and intuitive ordering process. Go one step further by creating unique landing pages for corporate and social catering. This way, you can modify your content, special offers and offerings to be exactly what those customers are searching for. For potential customers landing on your main website, it’s important to make your catering offerings clear and prominent. If your customers do not know you offer catering, your name won’t enter the consideration set as they plan their next meeting, event or social gathering. Again, consider creating unique sections for both corporate and social catering. Finally, optimizing your website to be found in catering searches includes your restaurant or brand in the consideration set for upcoming events. SEO is likely not a new topic for operators, but one that should be prioritized as an investment in potential catering sales. How are your customers searching for catering online? Is your website ranking on the first page for local searches? Dig into the answers to these questions to create your SEO strategy. Or let the professionals take care of it. Tapping into several points mentioned in this article, our agency created, and ran, a digital-only catering campaign for one of our restaurant clients over the 2017 holiday season. We geotargeted businesses and homes in catering delivery areas around hundreds of our client’s locations to reach those most likely to place orders for upcoming meetings, family events or holiday parties. 38.73 million individuals in office management, middle management, secretaries and/or assistants most likely to order food for or plan office lunches. 65 million individuals interested in or in the market for event planning, both business and networking. 45 million individuals interested in or in the market for catering, both those looking for catering and professional event planners. This campaign’s two-month run resulted in a 64% increase in sales year-over-year—a win both for our client and our team. Looking for more restaurant marketing insights? Catch a glimpse into the present and future of restaurant marketing with our free State of the Industry: QSR and Fast Casual report.